Fall is always an exciting and visionary time of year for photographers. Visually, of course, it is a beautiful and colourful time of year that is full of opportunity for stunning shots. In the scenic area of Southern Ontario, in areas such as the city of Owen Sound, we are lucky to have an abundance of nature that changes throughout the year. In mid September, the foliage turns to golden yellows, crimson reds, and bright oranges. This unique colour palette makes for a gorgeous backdrop when photographing a couple, especially during the early evening when the sun is low and the lighting gives everything a golden-haze effect. This shot was in early October, when the season’s leaves are in their prime colour-wise. As we wandered the grounds of the Grey Sauble Conservation Authority, we stumbled upon this large, tall tree in the centre of the park. The leaves had fallen and created a blanket effect on the surrounding ground. 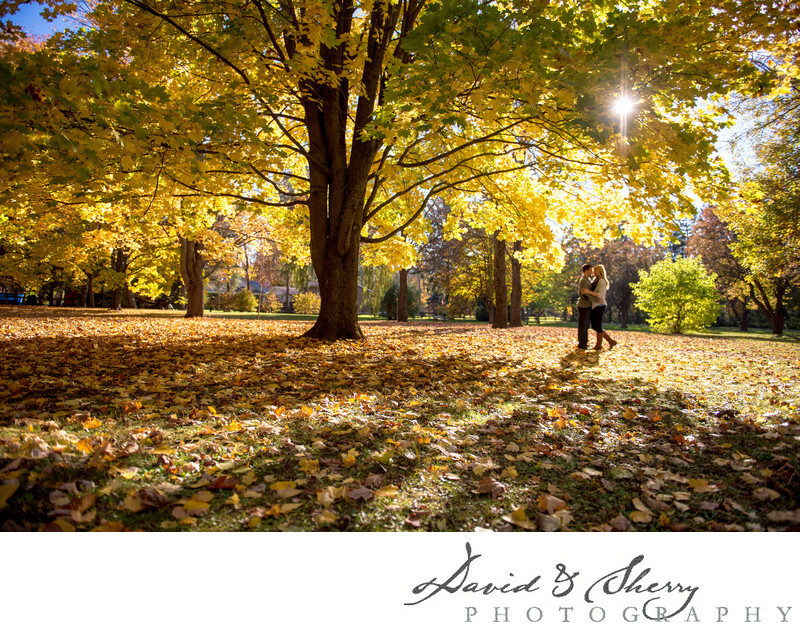 This wide shot of the couple sharing a romantic moment under the maple tree is almost magical and animated-looking. I particularly like the large maple that creates a natural canopy over the subjects, and the sunlight shining brightly through the changing leaves.